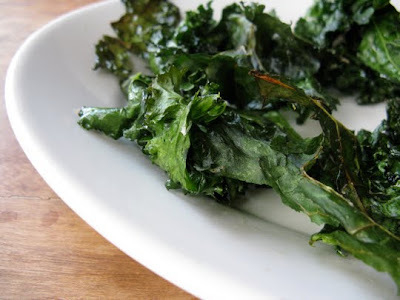 My friend Marly emailed me a healthy snack recipe for Kale Chips that she read about in Seattle Metropolitan magazine. I had some on hand so I made them that night. They were shockingly good. So good that I've been making them daily and can eat an entire batch by myself. I've used both regular Kale and Lacinato Kale and both kosher salt and sea salt. I've baked them for different lengths (10-15 minutes) for varied crispness and love them all ways. What a great way to eat a healthy, leafy green that's sometimes hard to sneak into your diet. Perfect time of year too since kale is strewn throughout the farmers markets. Yummy!